Ida, Lucille and Doris are part of a club - the Cemetery Club. Every month they meet at Ida's New York house for tea and then trundle off to the cemetery to remember the good times and gossip with their late husbands. Sam, a butcher, meets the widows at the cemetery while he is visiting his wife's grave and changes their lives forever. 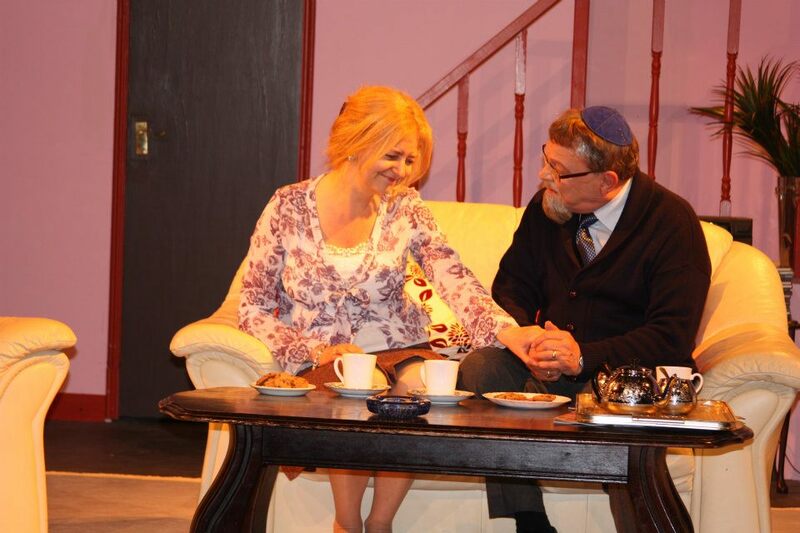 This touching play about three superannuated, feuding Jewish women is funny, wise and gloriously witty – Described by some as "Steel Magnolias" meets "The Golden Girls”. You may think that ‘The Cemetery Club’ is a strange title for a comedy but this play, which Belmont Theatre is presenting this month, contains an abundance of poignant, quick-fire New York Jewish humour focusing on the friendship between three widows who meet regularly to visit their husbands’ graves, and how the arrival of a widower threatens to change this set-up.This play takes the dark subject of loss and reminds us that through all things, friendship has a greater value than we can ever fully know. 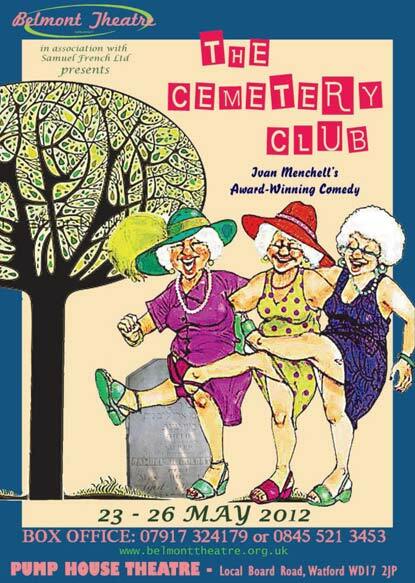 The remarkable stage play of The Cemetery Club, written by Ivan Menchell survived a short run on Broadway and was made into a film in the 1990′s starring Olympia Dukakis, Diane Ladd, and Ellen Burstyn and has also been likened to ‘The Golden Girls meets Steel Magnolias’. 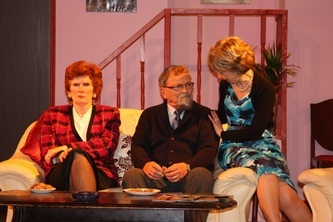 The show, which comes to The Pump House from 23rd to 26th May, was planned to be directed by a long standing member of Belmont Theatre, but tragedy hit before the first rehearsal when his mother, also an active member of Belmont Theatre, sadly passed away. In the circumstances, particularly with a play of this title, he had to withdraw and rather than cancel, we were lucky enough to find at short notice an excellent new director, Alan Bailey, from outside the group. Last year Belmont Theatre celebrated 65 uninterrupted years of putting on shows, be they dramas, comedies, thrillers or musicals. Originally formed in Harrow as ‘The Belmont Players’ they moved their performances to The Pump House, Watford six years ago, rehearsing in Pinner and Carpenders Park, and have built up a reputation that regularly achieves sell-out performances. Belmont’s November show is ‘Jack The Ripper – The Musical’, for which auditions, which are also open to non-members, commence in late June. Three Jewish ladies of a certain age, friends for a long time, all have something in common. They are widows and their husbands’ are all buried in the same cemetery. Between them, they form a ‘Cemetery Club’ and visit their dead husbands’ graves every month. Although they are great friends, they are all totally different from each other. Currently they are gathered in Ida’s living room prior to their monthly visit to the cemetery. Ida, the calmest of the three, is only just getting over the loss of her husband and feels she would like to find a ‘companion’ and begin a new life. Tatiana Cook played Ida, she had the character, of perhaps the youngest of the three, just right. She was the go-between the other two, remaining calm whilst both of her friends could be quite excitable. That is until she meets Sam, a widower, when the relationship between the three friends changes. Tatiana was very good in the role, able to contain her friends, seemingly the most sensible, down to earth character. One could see the gradual change in her once she found someone new in her life and the shock when it seemed that relationship had come to an end. 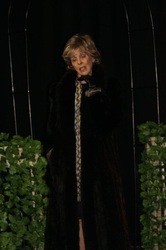 It was a lovely performance, although I did notice she was not wearing a wedding ring. Deliberate?? In complete contrast there was Lucille who, because she knew her husband had not been faithful during their marriage, had become very flirtatious, believing all the men she meets wanted to have an affair with her. She is obviously very lonely and sees these affairs (mostly in her imagination) as some sort of revenge for her husband’s philandering. Carole Baynes was terrific as Lucille, brash, funny, occasionally going OTT, although always in character, with some very funny lines. The one that stuck in my mind was her refusal to be a member of a club in which “half the members are dead”. She dressed well, always looking for, and getting bargains, although she is rather annoyed when Doris guesses the price she pays for a coat, hat and muff. Again, another fine performance. 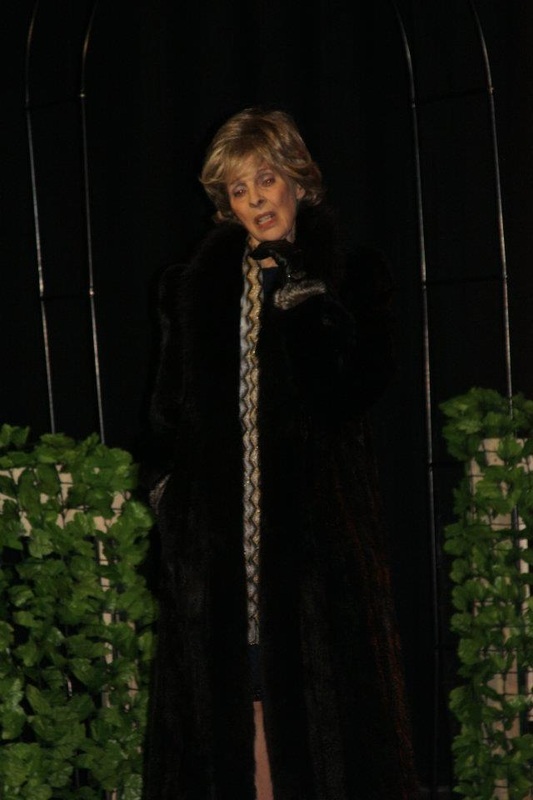 The third member of the trio was Doris, a wonderful performance by Julia Patterson. Fiercely devoted to her late husband Abe, she insists upon visiting the cemetery regularly and cannot understand Lucille’s flighty ways and Ida’s wanting to cut down on her own visits. She was very funny with some wicked dialogue that she delivered brilliantly, especially in guessing the price of Lucille’s purchases. The looks she gives to Sam when she leaves Ida and him alone was absolutely priceless. Because she and Lucille disapprove of Ida’s relationship with Sam and see it as a way of breaking up the friendship between them, they both talk him out of having any sort of relationship with Ida. Because this play was set in America, in New York, and because all the characters were Jewish, there could have been a tendency for their performances and accents becoming a sort of pseudo stereotypical type that one often associates with some ‘comedies’ involving Jewish people, however in this case this was not so, they all spoke their dialogue with an American accent without any embellishments. So far only the three ladies and their characters have been mentioned, there were however, two other people involved. 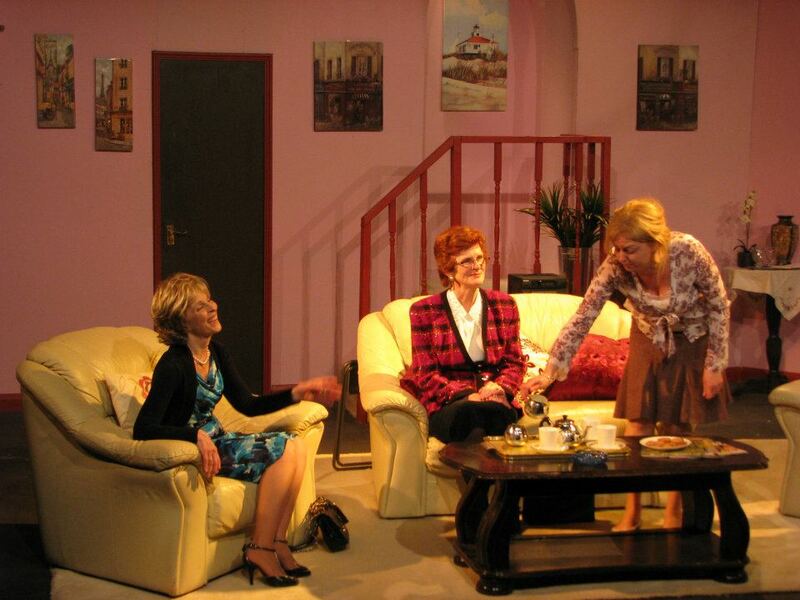 Whilst visiting the cemetery, the three ladies meet Sam, a widower, who has come to visit the grave of his wife. Sam is a butcher and Bill Baynes played him as a quiet rather introspective man who strikes up a friendship with Ida. A nice laid back performance from Bill. They gradually become attracted to each other, which of course appalled Doris, protesting that Ida is being disrespectful to her late husband, meanwhile Lucille is jealous at this emerging romance. They both talked Sam into believing the relationship between him and Ida is all wrong and instead of taking Ida to the fourth wedding of a mutual friend, Thelma, he brings another acquaintance of them all, Mildred, to Ida’s house, where all three are getting ready, to go to the celebration. Ida, of course, is very upset and only when Doris explains to her that Sam’s apparent coolness toward her was as a result of her and Lucille’s interference; once Doris admits this, Sam and Ida are reconciled and of course all ends happily. 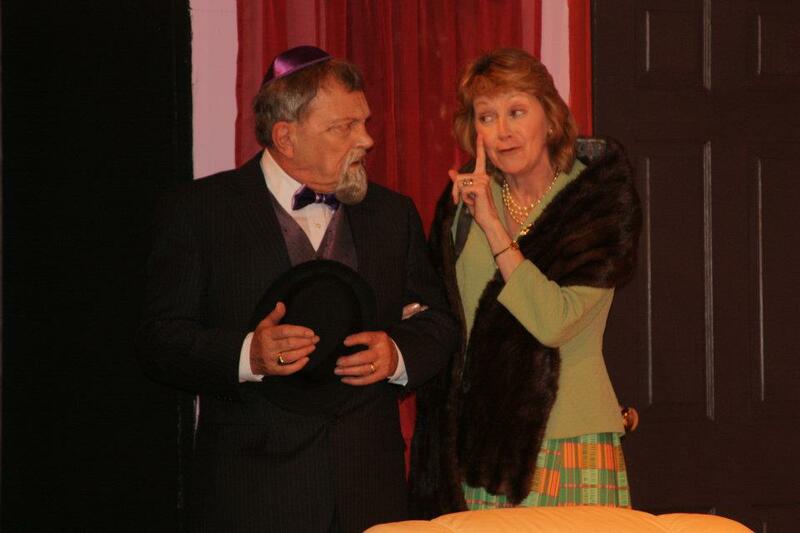 Although the part of Mildred only occurs toward the end of the play, Sharron Morten made the most of it. She played up to Sam, clinging to him and giving the impression that they had a ‘thing’ going between them. 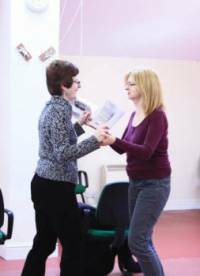 Sharron proved that even minor roles are just as important as major ones and that every part is important to the success of any performance. This was truly a very good play with excellent performances from the whole cast, and everyone connected with this production is to be congratulated. 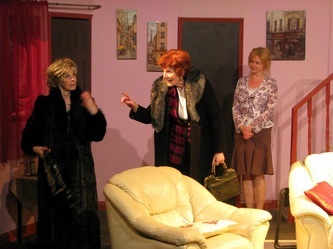 The set was very cleverly constructed with two thirds showing Ida’s living room, tastefully furnished with a contemporary three piece suite, pictures on the walls and furniture that one would expect to see in a well designed apartment. The other third on stage right depicted the cemetery, with three gravestones with one showing Hebrew letters, not quite accurate in that if the face of the gravestone is to be seen by the audience, there should have been some engravings in English. 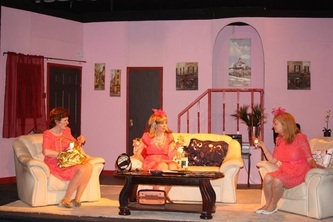 The clever design of the set was by Alain Bailey and Bill Rebello and constructed by Bill and members of Belmont; the Lighting Design, Claire Hamilton and operated by Lorna Alder who was also responsible for Sound. There was some delay in between scenes three and four in Act One and again in scenes three and four in Act Two, understandably as the three ladies had to change into outdoor clothing in order to visit the cemetery. The costumes, particularly Lucille’s, were great and congratulations to Anne Sutherland and Cast for supplying them. Mary Woolf was i/c properties, all seemed quite correct, Marion Shenton had little (if anything) to do as prompt. Bill Rebello did an excellent job as Stage Manager. 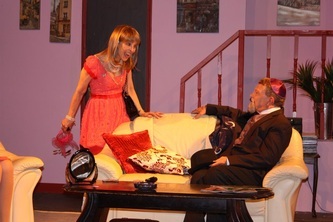 Bill Baynes was the Producer, and the play was very well directed by Alan Bailey who seems to have crossed from being on the stage as a performer to becoming a successful Director. Finally, our thanks to Frankie Hogan who, as always, looked after us during the interval.